Kick Start | News and Features | Style Weekly - Richmond, VA local news, arts, and events. Walkability guru Jeff Speck discusses the future of transportation and his formula for happy feet. So how does Richmond Stack up? Architect and aurthor Jeff Speck on Floyd Avenue Oct. 24. From proposed bike lanes on Floyd Avenue to landscaping projects on Broad Street downtown, there's heightened focus on enhancing Richmond's curb appeal. 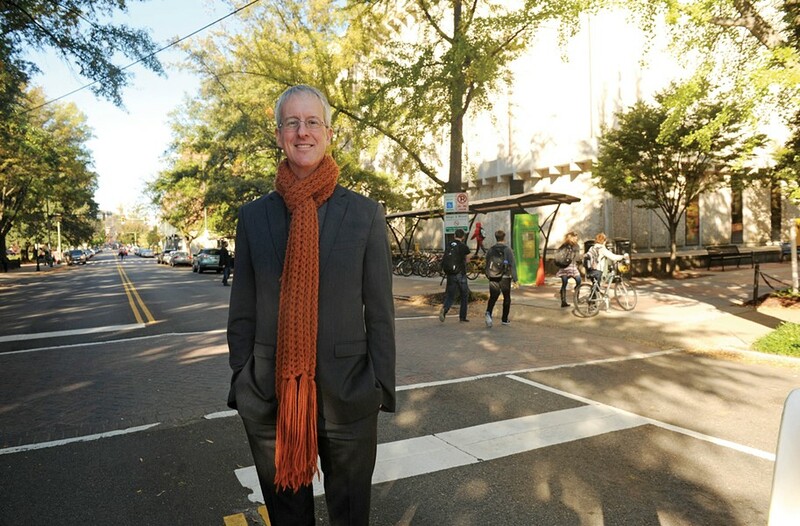 Some 300 people turned out at Virginia Commonwealth University on Oct. 24 to hear from Jeff Speck, a Washington architect, former design director for the National Endowment for the Arts and author of the recently published "Walkable City: How Downtown Can Save America One Step at a Time." Speck was the inaugural speaker at the university's Morton B. Gulak Urban and Regional Planning Lecture series. The late Gulak was a longtime professor of planning who championed revitalizing the city's underused neighborhoods. Speck told the audience that he's been traveling the world and giving one talk week for the past 40 weeks. He continued the conversation with Style Weekly. Style: What two or three ideas have you picked up from your recent travels? Speck: Bicycles are the most efficient form of transportation. They are not a silver bullet, but we can see how they have transformed city after city from Davis, Calif., to Chicago to Washington, D.C. One-fourth of all millennials have opted out of getting their driver's licenses. They are biking. In greater Richmond, 20 percent of the population lives in the city and 80 percent lives in the surrounding counties. Do we give up on the suburbs ever being walkable? There can be outward migration and inward focus at the same time. Atlanta has some great [suburban] neighborhoods. There's walkability in these places even though nothing's been done to entice it. There are people living without cars. Even Phoenix has areas where people want to walk. Carmel, Ind., is a wealthy Indianapolis suburb where many [traffic-calming] roundabouts have been installed. There's an area there, between two roundabouts, of about one-half mile that has been developed and is highly walkable. One of the best solutions for any urban or suburban area is to change from being a single-use place into a multiple-use place. Create conditions for people to find places to go. What are some simple things a city can do to enhance walkability? One is to convert one-way streets to two-way. This is safer because vehicles aren't racing in the other lane. The best retail streets are always two-way — although there are exceptions like New York's Fifth Avenue. Rather than discuss walkability as an aesthetic issue, which I did for many years, it has to be viewed as an environmental, economic and safety issue. These factors can be measured. And nothing is effective unless there is a grass-roots effort to force change. Grass roots force city staffers to make changes. People have to hold officials' feet to the fire. What cities have you not visited that you would like to explore? I've been to 48 states but not the two Dakotas. And I've not been to Minneapolis, although I understand they've somehow survived the skywalks [the enclosed walkways connecting office buildings]. I need to visit Copenhagen. They've been the most effective city in the world at creating a strong pedestrian core. Speaking of walkable, what kind of shoes do you wear? I'm wearing a pair of black Eccos, a cross between a sneaker and a dress shoe. It's kind of a bowling shoe. These allow me to never have to change my shoes as I move from activity to activity. I've inserted athletic orthotics to protect my feet. What are your impressions of Richmond? I wasn't sure that Richmond was one of the great Southern cities, like Charleston and Savannah and Alexandria, if it wasn't so melded to greater Washington, D.C. The Fan District and Historic Church Hill are as good as neighborhoods get. From this trip I can see it is one of the great Southern cities. All it needs is additional residents to kick it into its sweet spot.